Photo Aura Readings. New Workshop! Photo Aura Readings. 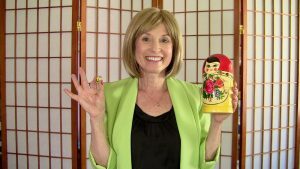 See me holding the big Matroyshka doll? That’s the surface of life. And that tiny doll I’m holding in the other hand? That symbolizes her aura. Photo Aura Readings. Sure you can learn to read auras from regular photos. Today we’re launching an on-demand workshop to give you those skills. As new in the world… as the breath you are breathing right now. Also, over the years, sometimes I have taught an advanced aura reading workshop. In person. But now you’ve got such an exciting new resource. An overview of all three workshops available as of today. Including the five-lesson Free Intro. And a brand new page describing Aura 102. Also known as Read Auras from Photos. Yes, it’s really just 10 lessons. And yes, the tuition of $195 buys you these resources: 40 Audios, 9 Videos, 23 Worksheets & Handouts. Plus you get my fave, the interactive Forum for each lesson. Allowing you to join an informal community of aura readers, ask your questions, see other Q&As between students and me. Photo Aura Readings. Easy. After You’ve Learned How To Read Auras Live. Of course, there’s a prerequisite for reading auras from pix. That’s Aura 101. Where you learn all the rest of Stage Three Energetic Literacy. By contrast, today’s new workshop helps you to take your skills out into the big wide world. Completing your Stage Three Energetic Literacy fully, by adding the ability to read auras from photographs. Giving you a huge supply of auras to snoop around. Ahem, research! I mean really, if you’re a people person. And you have curiosity. There is nothing like learning these skills. Where all you need is an appropriate photograph. (Choose from a gazillion online.) And then read all the chakra databanks you like. If you’re looking to spice up your Technique Time, I promise you. You could use all 20 minutes a day… fascinatedly reading auras from photos. Ha, maybe “fascinatedly” is a new word. Let me assure you, reading auras from regular pictures could be like a new world. Blog-Buddies, I’m feeling such gratitude right now. Warm appreciation to my aura reading students in Tokyo, Osaka, London, Washington D.C, Sterling, Boston, Cincinnati, Los Angeles, Seattle, and probably other cities that I can’t remember right now. Being in a somewhat gushy state. And more thanks to those of you who’ve learned aura reading from personal mentoring. With one-on-ones that always teach me so much. My international students, who’ve read the how-to “Aura Reading Through All Your Senses” in English-speaking countries or Germany or Bulgaria or China or Spain or India or Russia or Slovenia or The Slovak Republic. A special thanks-from-to-the-heart to that smallish but mighty group of RES Experts. Each of you is an aura reader, of course. Each of you pays that knowledge forward by helping clients. And contributing so much to our community with the Really Effective Skills. How Gladys is becoming confident that, really! Yes! She can read auras now. Goodbye to old fear and doubts, that she refused to halt her progress. In the words of this wise student, what replaces all those old fears and doubts? Yes, it’s all about truth. Aura reading lights up the truth for us. Still others feel it or smell it or know it, etc. We don’t all need to have the same God-given gifts to succeed at this. All we need is a bit of time, a bit of patience and commitment. and then we can get that skill for life, Aura Reading Through All Your Senses®. Helping every one of us to bring more truth into this world. Big congratulations Rose. Having learned in person how to read auras from photos, I can say this has been my most used aura reading technique. It’s come very handy in discerning whom I engage in and don’t on dating sites/apps 😉 and that’s only one of the ways I’ve put these skills to use! Yay!!! Congratulations! Excited for you, and for me! I’ll be signing up soon. Can’t wait for the next level in aura reading. Thank you so much Rose! LOGAN and LIANE, you’re just lighting me up. I don’t think I could be developing all these online workshops if I didn’t have students as inspiring as the two of you. Thanks for what you’ve written here, and your enjoyment all along the way. I love and so appreciate the quality of information you bring in your workshops! Just got back from a week away without internet access, to find Aura 102 is available, and those 5 live workshops. Woohoo, my Christmas has come early! A big thank you from me to AJ also! I am doing Aura 101 currently and it is very intuitive and user friendly. So excited about all these new workshops! Can’t wait to take them all! So excited to be able to teach you the best of RES, EMILY T and KATRIINA and AJ! Today Workshop Manager Mitch has just uploaded descriptions of the fifth of the five new workshops. If curious, you can have a look here. Replying to #3… My excitement is as real as the changes have been to my life, thanks to RES. Thanks to you. Christmas Poem 2017. A Hanukkah Poem, Too.